- The Dollar Is Still in a Bull Market. - What Is the Fed Thinking? 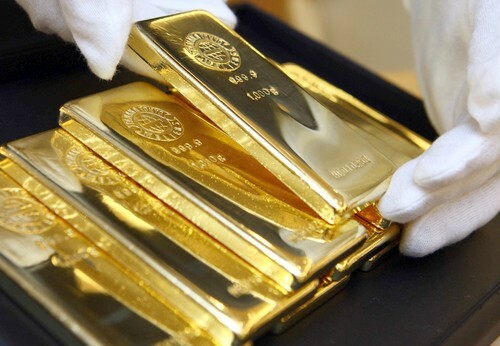 - What Do My 8 Indicators Say What's Going on with Gold? - Deflationary Forces Are Still in the Air. - Where Are We Going with Gold and What Advice Do You Have? Gold has bounced from the $1,050-$1,100 range it had traded in and moved up about $150 and I keep getting emails asking me whether I think the $1,000 mark can still be broken. For those who have followed my call for lower prices in gold, my advice has still been the same; dollar cost average into your allocation into precious metals. Whether or not gold falls below $1,000 is secondary in nature and only for those who want to time the market. That said, I am still in the camp that we fall below $1,000 in price and all we have seen in this latest move up in the price of gold is a dollar decline. This will not last. The price of gold broke out of the range and at the same time the dollar did too as the chart below shows. But also, the dollar bottomed and gold topped at the same time as well and Monday, with U.S. markets closed, reversed together again with gold moving up $8 and the dollar falling 15 cents. Zooming out, we see the dollar is still in a bull market and gold is still in a bear market, both since 2011. For over a year, we have heard the financial media call for higher rates in search of a reason to be long stocks. Quantitative easing was ancient history according to these folks and they needed the Fed to raise rates to give them confidence their beloved stock market would continue on its merry way higher. But a funny thing happened on the way to the forum (yes that is a reference to an old movie and to the fall of the Roman Empire). The Fed ignored all of the economic data that mattered and concentrated on unemployment figures. Their theory was that as long as unemployment was dropping, inflation would come. But unemployment data at best is skewed and anyone who looks at the U-6 data saw that before the Fed's decision to raise rates, the U-6 rate that takes into account those who are marginally attached to the labor force and total employed part time for economic reasons actually rose from 9.8% in October to 9.9% for November. The Fed somehow missed this in their decision-making process. The truth is, this is a one and done Fed rate hike. Janet Yellen even made the comment which no one but me will concentrate on in that she said they would have to do something if "global deflationary pressures" existed. Steve Liesman has gone on to change his mind about rate increases from 3 to now "0-4" increases for 2016 I haven't changed my mind, the answer is zero rate increases in 2016 and a definite possibility of more QE ala Europe and Japan and the PBOC. As for the Fed, they believe they are still on a "gradual" rate path, but no rate increase in March. This delay in increases could be in part attributed to the fact that the U.S. stock market began 2016 with the worst start ever. Doug, What About Your 8 Indicators That Tell You Where Gold Will Go Next? Anyone who has followed me for awhile knows I happily share what I see, so we can keep each other in check. Unfortunately or fortunately, depending on how you look at it, I had to take time to write my next book Illusions of Wealth and I didn't take the time to write an article. I wrote AN ARTICLE on a plane titled The Fed's Interest Rate Bluff and had to fine tune it, but never got to it. I wish I had as I just opened it up today for the first time since then and it would have helped some of you, so I apologize. But the big picture hasn't changed as you'll see in the chart at the close. I did however write 5 days a week what I saw going on through the ETF Leveraged Daily Trading Service here at Seeking Alpha as we caught some of the ride higher in miners. I refer you to this link as to how I called gold this year (there is a 2-week free trial as well). 1/31 SLV & USLV signaled red on the daily (my Trading Rules say you can take profit anytime you want and don't have to wait for signals). 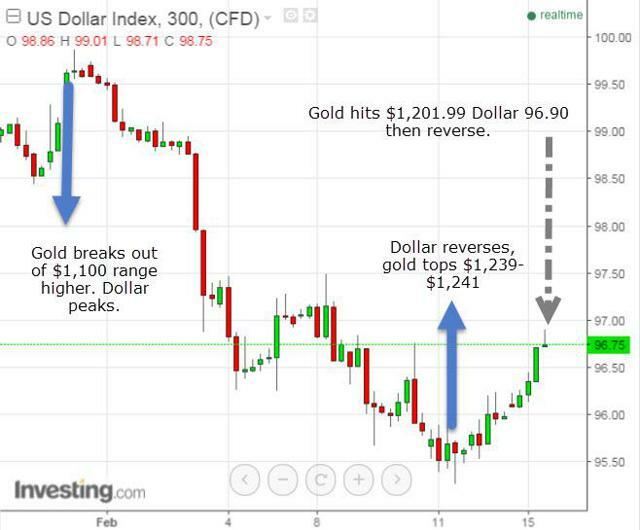 Here is a quick update on the 8 indicators that tell us where gold might go next. You can see that some of them might have given you reason to invest in gold, with or without my guidance. I originally wrote that article August 3, 2014 and they have been pretty strong indicators of trend. 1. Demand from buyers; it has picked up some, but nowhere near what it was at the last two bottoms. 2. Stock market; was falling and investors looked for alternatives which they found in gold and gold miners. 3. VIX; Passed 20 and began showing fear, something I said was the "missing ingredient" in a past article. 4. Europe fighting deflation - they still are. 5. Dollar; turned from bull to short term bear as you saw above. 6. Velocity of Money; still pushing on a string - deflation. 7. Commodity prices; had a little move up here. Oil still weak. CRB Index at resistance levels. 8. 10-Year Treasury (was 2.55% in August 2014 and is 1.75% now). Now That You Know Where We Are, Where Are We Going with Gold and What Advice Do You Have? 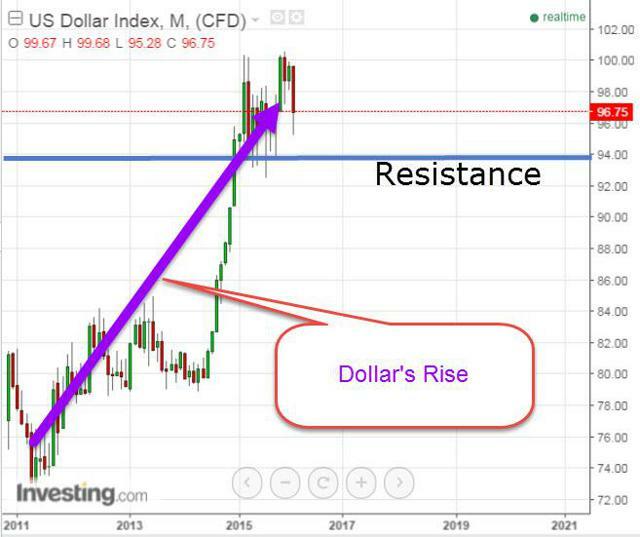 Many of you know that I have been in the deflation camp for a long time and that this would put pressure on gold and silver prices. So far, it has and a blip up in prices hasn't changed the overall analysis of what I see coming on the horizon. All I try to do is put the pieces of the puzzle together and show you the work and hopefully you can make good decisions based on what you read. You as an investor don't need someone to tell you what to do, but my advice over and over hasn't been bad; dollar cost average into a position in physical metals. Some may be investing in SPDR Gold Trust ETF (NYSEARCA:GLD) or iShares Silver Trust ETF (NYSEARCA:SLV) or the like because they can't buy the physical. If you are buying metals today, there is one analogy that I will keep bringing up. If you would have invested in the DOW when it first hit 8500 you would have been upset once it moved to 7500. But the investor at 7500 and 8500 were not complaining when the DOW hit 18,000. Chances are they didn't sell either AND are still holding with the DOW at 16,000. The point is, with gold and silver you should treat it like it's 2009 and invest accordingly. Chances are we won't hit the exact bottom or those waiting for my "all in" call may not see my predictions come to fruition. Dollar cost averaging into your allocation is the best advice I think anyone could give. You naturally have to assume that gold will fly from these levels or below which is why I am writing my book to begin with. I am then immediately finishing my 3rd book I have been working on 10 years called "We the Serfs!" as I think it can make a difference in the coming elections. But if you want the best indicator of where gold will go, look no further than the dollar for now. One may lead the other for a bit, but they always get back in sync. 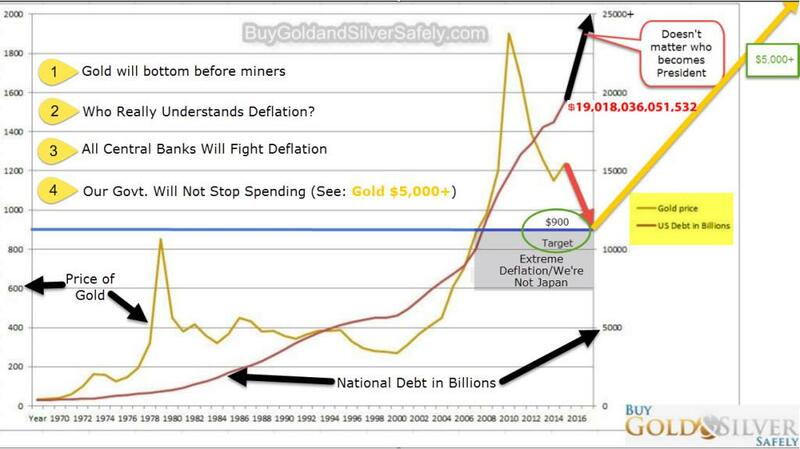 For those though looking for the big picture of what I think will happen with gold, I offer the following chart to sum things up. If you have invested in gold mining ETFs (or the individual miners) like Market Vectors Gold Miners ETF (NYSEARCA:GDX), Market Vectors Junior Gold Miners ETF (NYSEARCA:GDXJ), Direxion Daily Gold Miners Index Bull 3x Shares ETF (NYSEARCA:NUGT) or Direxion Daily Junior Gold Miners Index Bull 3x Shares ETF (NYSEARCA:JNUG), make sure you have stops in place. If I am right about the coming deflationary contraction, it won't be pretty for most assets. I don't mind one putting their funds in cash, PowerShares DB USD Bull ETF (NYSEARCA:UUP), or iShares 20+ Year Treasury Bond ETF (NYSEARCA:TLT) in the meantime.